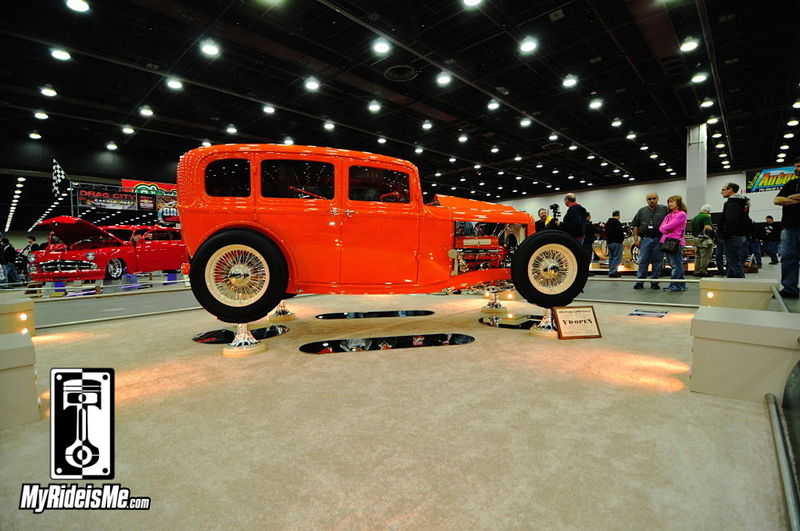 1932 four door sedan is a great contender. 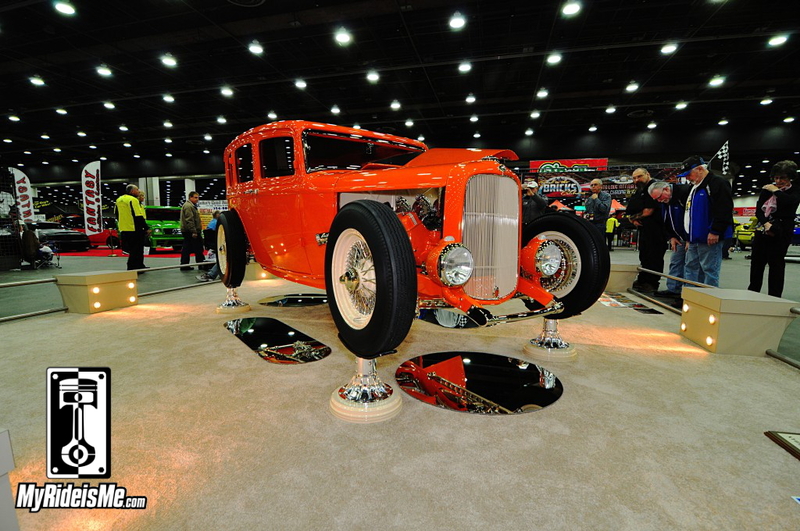 But this year, JF’s Crazy Custom Riviera won the Ridler. 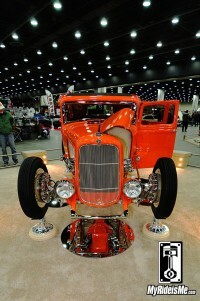 So here’s one of the baddest, most traditional yet custom, and at the same time beautiful, hot rods you’ll ever see. And for all the haters… yea, it’s got four doors! Click on any pictures, even the thumbnails, to see them full size. These next couple pictures I shared in the 2014 Great 8 Preview story. It should be apparent immediately that this sedan is built right. 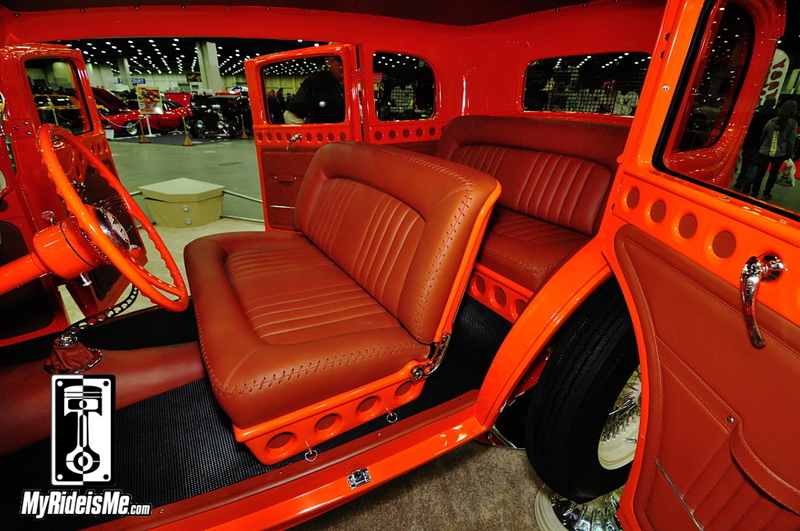 This picture shows the cream colored wires tucked in tightly to the body as well as how the custom made frame rail follows the sedan body perfectly. The elegant curve up front making the needed drop is an easily missed touch of class. I love the custom made jack stands too! Those are polished Winters quick change bells with Lincoln brake drums underneath painted to match the wheels. Do me a favor and stare at this picture for a minute. (click to make bigger if you want) See everything going on here? 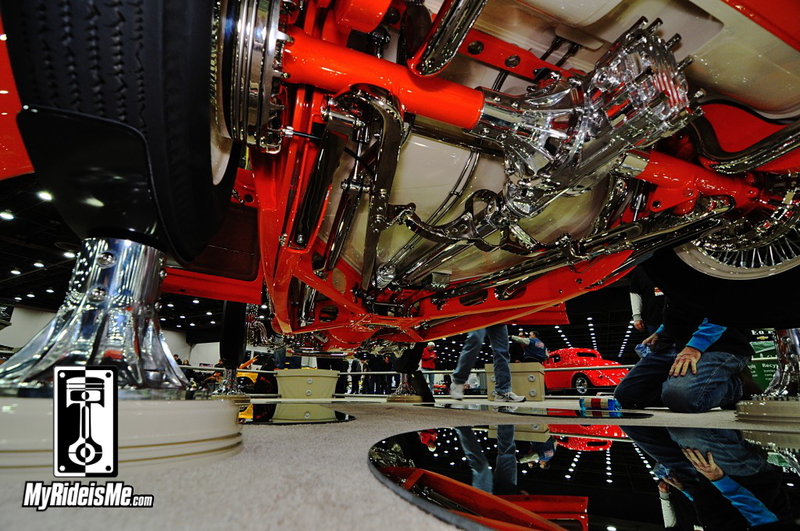 Besides all the blinding chrome, take a look at the oil pan. That’s the sway bar built right in making the engine part of the suspension! Then you’ll see how the quarter elliptical spring tuck neatly into the frame rails. 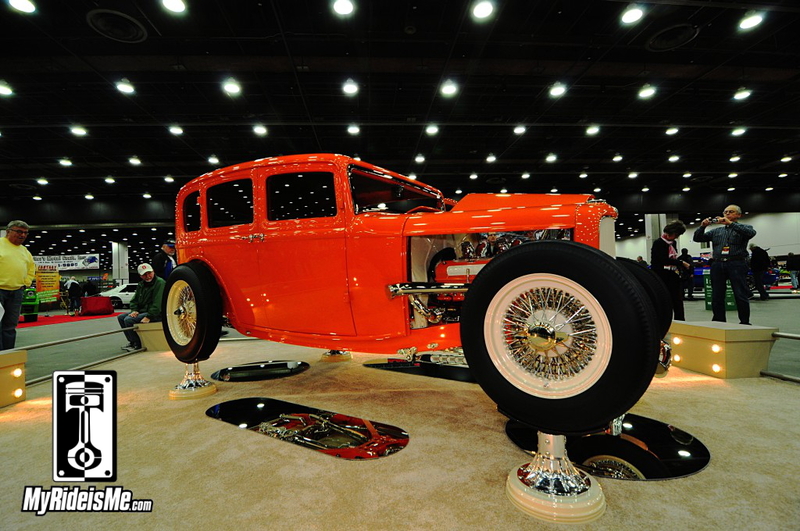 With every fastener polished and the 312 mill smoothed, painted and shined to match the body work, the underside and front of this hot rod is second to none. 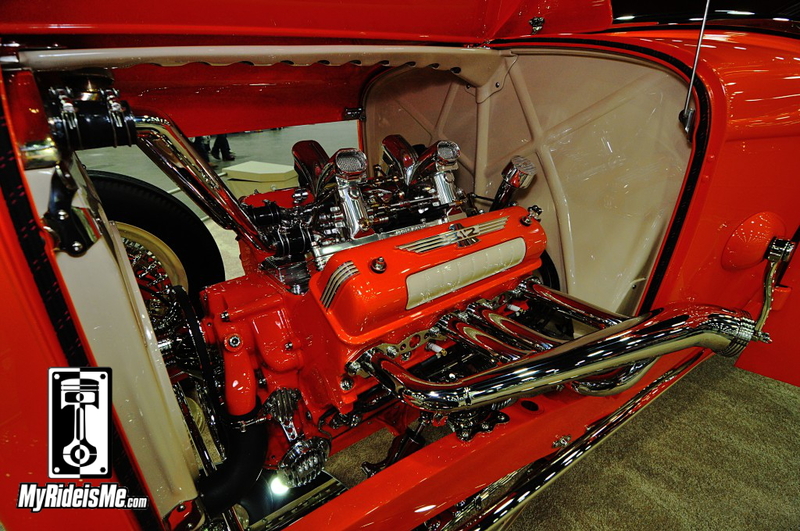 The power for this deuce comes from a mid 50s Ford 312 cubic inch Y-block. No boring SBC or heaven forbid an LS motor here! Up top is a Hilborn injection system originally made for a Y-block. 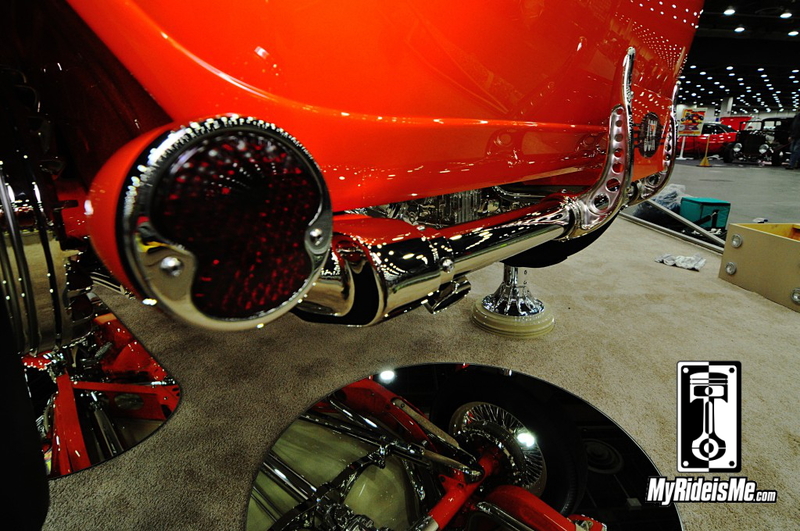 The stacks are custom machined to match the exhaust tips. 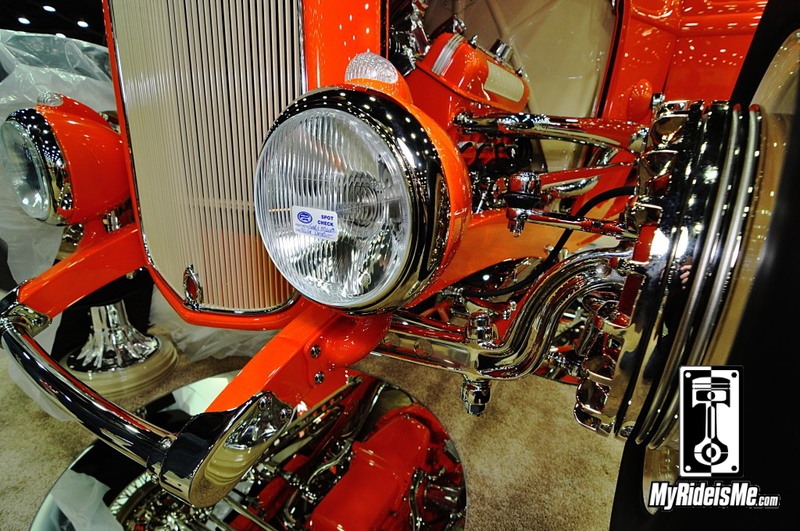 Of course the fuel injection has been converted to electronic, but you could never tell. There’s hardly any wires showing at all! That’s because JSK used a “false” firewall to hide all the electronics. Then, all the wires run down the center brace to the front. This is a new kind of CLEAN! 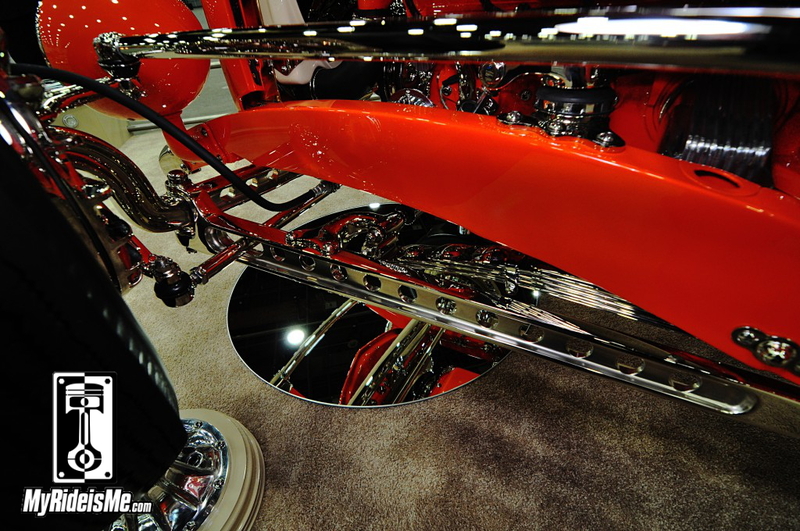 The pedals, believe it or not, were builder Jeff Kensey’s favorite detail on the car. He was quick to point out others, but take a minute to look at the handmade pedals, the way they’re hung and how the whole assembly fits together perfectly! 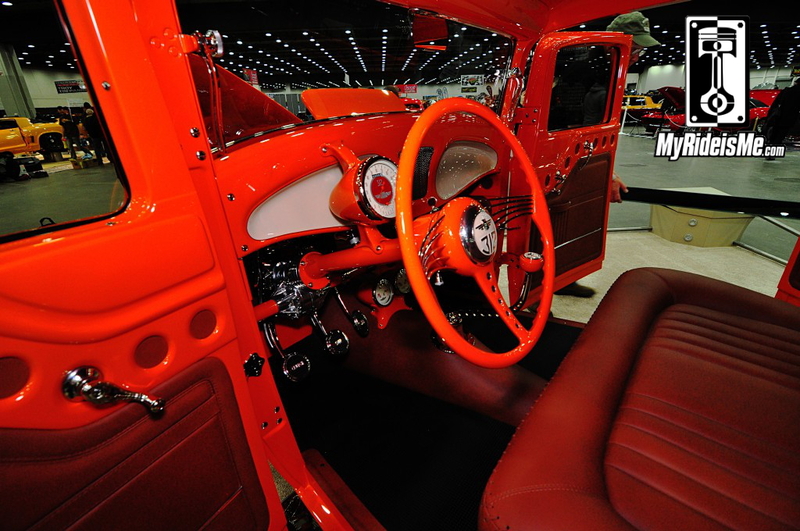 That shifter is a work of art too! 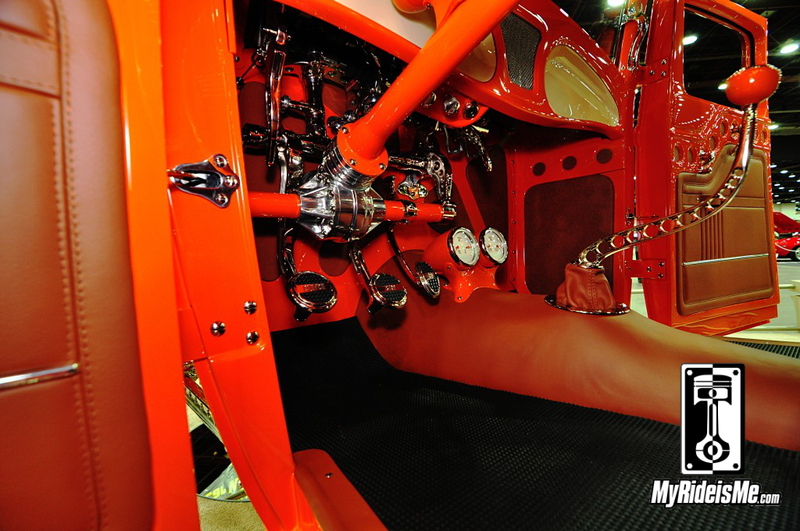 Every hot rod’s got to have a third pedal! 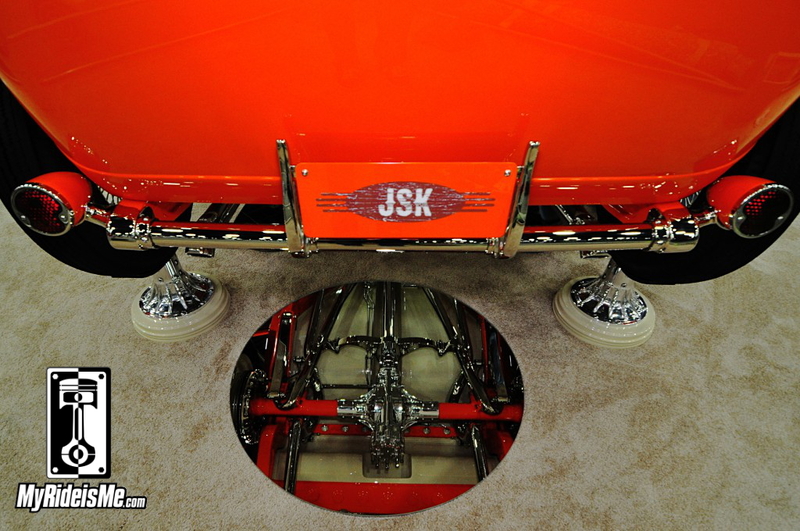 JSK pull off what might be a magic trick for four door sedans? They made the B-pillar disappear! See it? The front door latches onto the back door. Then here’s the rest of the pictures I took. 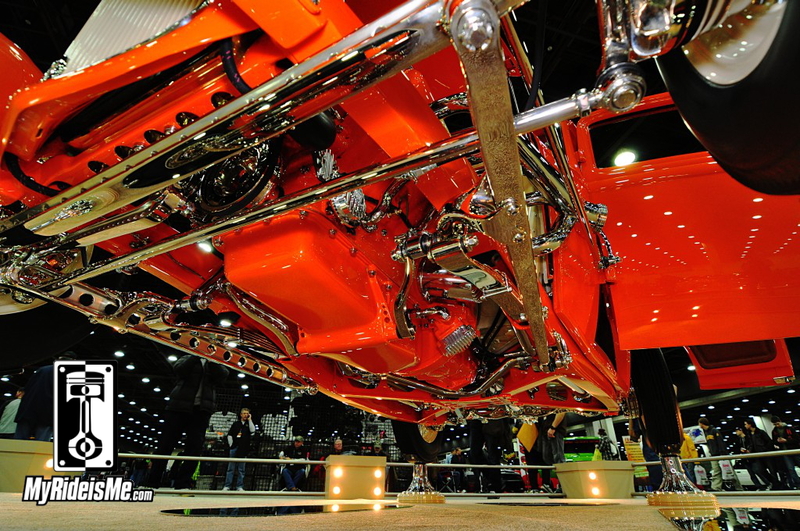 Looking great from all angles! Hope you like this hot rod as much as I do! 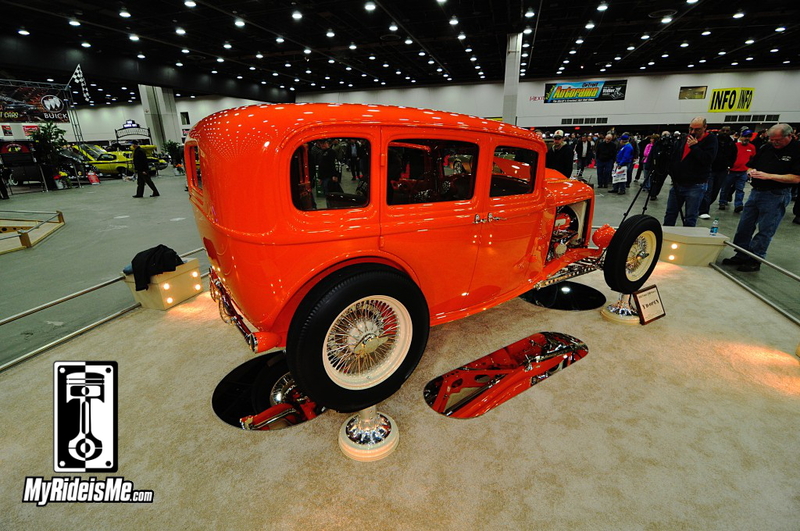 If you’re looking for more Detroit Autorama or Ridler Award Coverage, the easiest thing to do is go to this page: All Pictures and Stories from Detroit Autorama. It’s automatically updated for all the new stories. Having spent 3 years of my life working on Don Smith’s 32, I am amazed that I never get tired of looking at it. There are details that won’t be seen until some museum restores it in a hundred years or so from now. 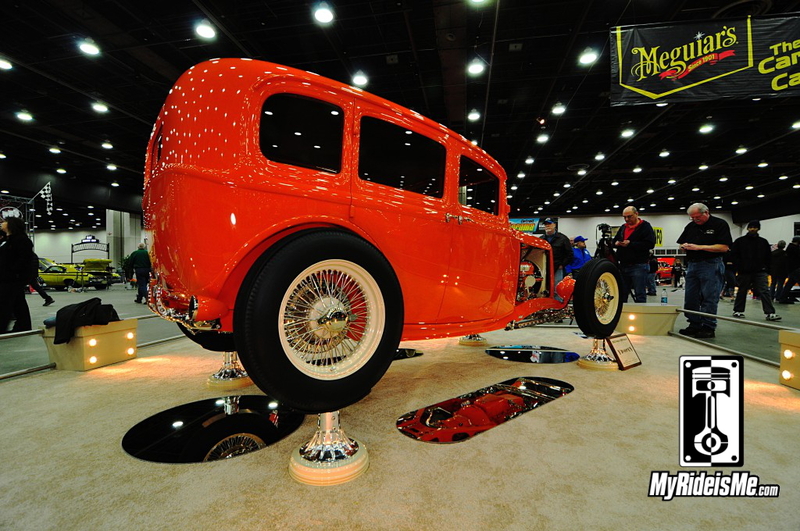 Don was so generous to allow us the opportunity to show off a little and let our creativity dictate the way the car was built. 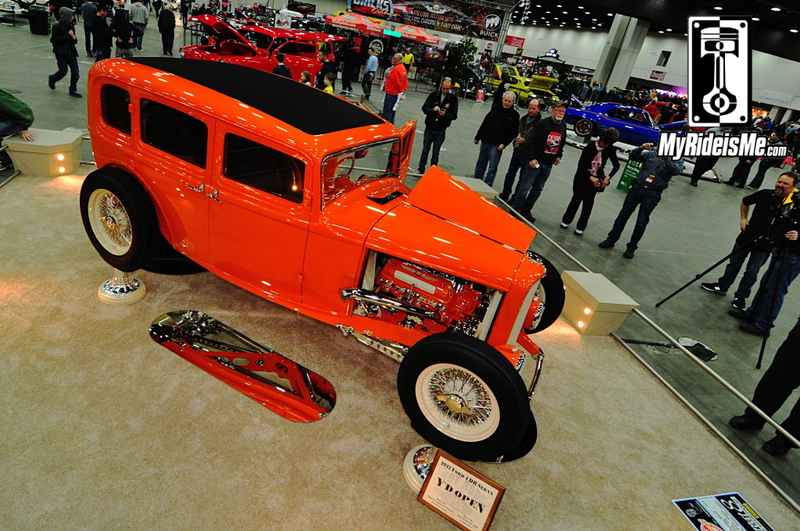 I can never thank Don enough for letting us build cars for him and his wife Caroline. I would also like to thank the author of this article for the kind words and pleasant critique. It’s always nice to have someone who has seen quite a few really nice cars appreciate our work. Our goals were to make it to Detroit and hopefully get a Great 8 pick. I believe we succeeded, but now our goals are higher and the next time is going to be interesting for sure.